Skullcaps are in the Mint Family. As you view the images in the photo gallery below, note the square stem on the plants –this is a characteristic of all mints. 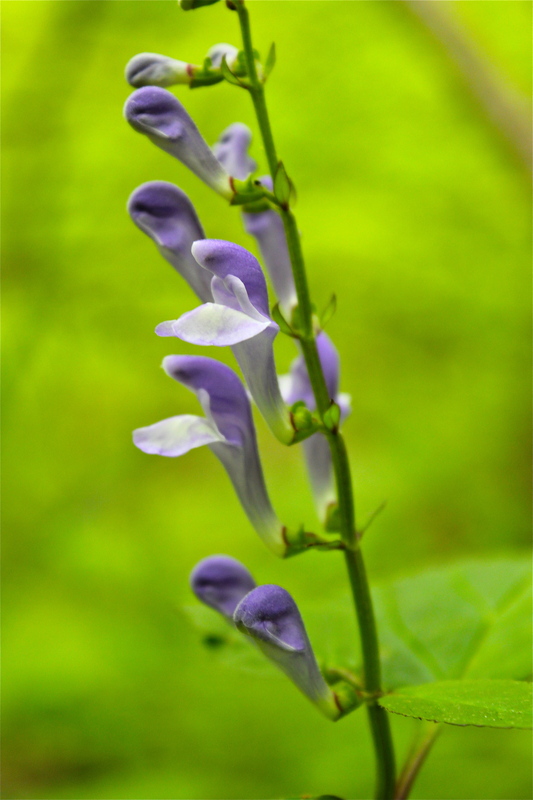 The leaves of skullcap are oval, pointed at the tip, and serrate (or toothed). The leaf edges turn dark red as they mature. In May and June, a long spike of 1-inch blue or purple flowers is formed at the top of the plant. Showy skullcap is a native of Appalachian woodlands. I found these specimens in two places: at Falls Ridge Preserve in Montgomery County during the first week of May and along the banks of Big Stoney Creek in late May. I think the closed flowers look like little turtle heads! Also in bloom at Fall’s Ridge in May was Goatsbeard!